Born to a peasants family. Worked as a kitchen maid at the house of Count Henry of Rattenberg at age 18. The count's wife, Ottilia, ordered Notburga to feed leftover food to the house swine; she gave it to the poor instead. Warned about her behavior, Nortburga fed the leftovers to the pigs, and gave much of her own food to the poor. Ottilia saw this as a form of disobedience, and dismissed her. Worked as a servant for a farmer in Eben am Achensee, Austria. However, when her the lady Ottilia died, the count re-hired her, and she spent the rest of her life as a servant in his house. Worked with the poor. Miracle worker. Her master once saw her leaving the house with something bundled in her apron. Thinking he had caught her disobeying the order to not give away food, he demanded to see what she carried. To keep her out of trouble, the food and wine had turned into wood shavings and vinegar. When she took the job with the peasant farm family in Eben am Achensee, Notburga made it a condition that she be allowed to skip her chores in order to attend Mass on Saturday night and on the eve of feast days. On one of these occasions, the farmer tried to get her to keep working. Notburga said she would let her sickle decide the matter, and threw it into the air. The sickle hung suspended in the air, and Notburga went to church. Shortly before her death, Notburga told Count Henry to place her corpse on a wagon drawn by two oxen, and to bury her wherever the oxen would stop on their own. The animals drew the wagon to the chapel of Saint Rupert, where she was buried. Born to a wealthy and promininent noble Italian family. Well educated, especially in theology and law. Ordained, he served as canon to Holy Cross Abbey in Mortara, Italy. Abbey prior. 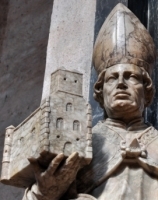 Bishop of Bobbio, Italy in 1184. Bishop of Vercelli, Italy. Mediated disputes between Pope Clement III and Frederick Barbarossa, and for his efforts was named Prince of the Empire. Papal legate to Northern Italy. Negotiated peace between Parma and Piacenza in 1199. Helped formulate the Rule for Saint Borcard and his hermits. This Rule later was adopted as the Rule for the Carmelites, and thus Albert is considered a co-founder of the order. Patriarch of Jerusalem in 1205 under Pope Innocent III, a position that generally led to conflict with the Muslims, and martyrdom. Since his lands were wholly in the hands of Saracens, he established his see city at Akka (Acre). Held the office nearly ten years. Well known for his involvement in both state and church matters, and as a peacemaker to the Frankish factions in his see. Summoned to serve in the General Council of the Lateran, but murdered before he could attend. The feast was celebrated in Rome before the end of the 7th century. Its purpose is to commemorate the recovering of that portion of the Holy Cross which was preserved at Jerusalem, and which had fallen into the hands of the Persians. Emperor Heraclius recovered this precious relic and brought it back to Jerusalem on 3 May 629. Joined the Benedictine Cistercians at Bonneveaux, France at age 20 along with his father and two brothers. Monk. First abbot of Tamie Abbey in the Tarentaise Mountains where he built a hospice for travellers. Reluctant archbishop of Tarentaise, France c.1142. He worked to reform the diocese, removing corrupt clergy, supporting dedicated priests, caring for the poor, promoting education, and revitalizing the faith and church involvement of all his flock. Started the custom of May Bread - free bread and soup distributed throughout the mountain region; the tradition continued for centuries until ended by the anti-Catholic French Revolution. In 1155 Peter disappeared only to be found hiding out as a lay brother in a Cistercian abbey in Switzerland; he had badly missed the simple life of a pious monk, but agreed to return to his duties as a bishop. Advisor to popes, kings and laity, he defended papal rights in France, and worked to bring peace between King Louis VII of France and Prince Henry II of England. Entered the Society of Foreign Missions of Paris seminary in 1774, and ordained on 17 September. Missionary to Szechuan, China in 1775. Imprisoned for six months in 1784 during a government persecution of Christians. He was re-assigned to Macao, but return to the Chinese missions in 1788. Titular bishop of Thabraca and co-adjutor Vicar Apostolic of Se-Ciuen, China on 24 July 1798; he succeeded to the Vicar Apostolic on 15 November 1801. Spent the next 15 years in constant danger during the persecution of Christians and foreigners. Betrayed to the Chinese authorities by a scared native Christian. Martyr. Her family was of Spanish descent, and she may have been the daughter of Claudius Antonius, Prefect of Gaul. Married to Emperor Theodosius the Great c.376. Mother of Arcadius, roman emperor of the east, and Honorius, roman emperor of the west; a daughter, Pulcheria, died in childhood. Zealous supporter of the Nicene Creed. Considered a pillar of the Church and model of Christian virtue by Saint Gregory of Nyssa. Priest in the diocese of Moulins, France. Imprisoned on a ship in the harbor of Rochefort, France and left to die during the anti-Catholic persecutions of the French Revolution. One of the Martyrs of the Hulks of Rochefort. Born to the Spanish nobility, Raimondo was a knight who fought against the invading Saracen Moors to defend Christians. Friend of Saint Peter Nolasco who received him into the Mercedarians as a lay knight on 10 August 1218, the founding of the Order. Known as a soldier with a life of deep prayer and meditation. Early bishop of Cologne, Germany. Fought against the Donatist heresy. Old legend says he was born in Palestine and sent to the Cologne region by Saint Peter the Apostle, but he worked centuries later. Son of Saint Euthymius. At age 11, during the persecutions of Diocletian, he was arrested, tortured and martyred for the crime of being Christian. Friend of Saint Columba. First bishop of Cashel, Ireland. Wrote a glossary of the Irish language. The Psalter of Cashel he compiled survives to today. Mercedarian missionary to the Araucani people of Chile. Noted for his pious life, his success in bringing the Araucani to the faith, as a miracle worker, and for living to the age of 102. Imperial Roman soldier. 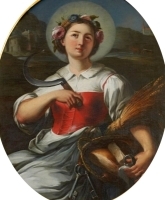 Married to Saint Sallustia. Convert to Christianity, instructed in the faith by Pope Saint Cornelius. Martyred in the persecutions of Decius. Married to Saint Caerealis. Convert to Christianity, instructed in the faith by Pope Saint Cornelius. Martyred in the persecutions of Decius.